Hello. I have been using bandicam for a while and it is the best recording software for me. But its videos are not so smooth. When I compare frame by frame, there are too often 2 or sometimes 3 same frames in a row. May there be any solution in next versions? I know it would decrease my FPS in game, but my computer still should handle it without any problems. And by the way when I set video to less than 23 FPS, then the video has exactly 23 FPS. Re: Repeating frames in videos. there are too often 2 or sometimes 3 same frames in a row. => We don't understand what's your mean. Could you send the video file at bandicam@bandisoft.com? Here you can see. Frames are quite often the same. 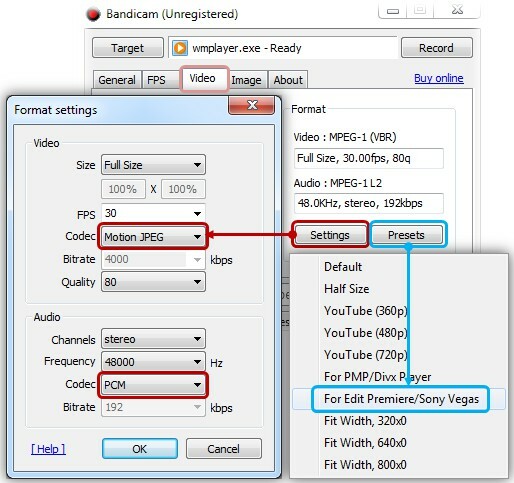 If you want to edit the recorded streaming video in Sony Vegas, you should change the output codec of Bandicam. Did you choose "Motion JPEG" video code and "PCM" audio codec? Sony Vegas was used just to show it frame by frame. Changing codec or present don't change anything in this case. There are still 2 exactly same frames in a row sometimes. If I play a video from fraps frame by frame, there is every single frame unique and the video is smoother than from bandicam.